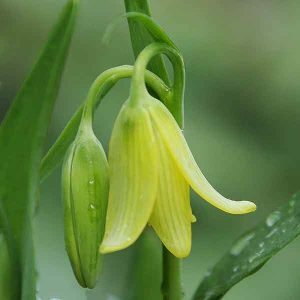 One of the easiest, and earliest of the Fritillarias is Fritillaria sibthorpiana. Very attractive lemon to buttercup yellow flowers in late winter. The species is from South West Turkey, and with bell shaped flowers the petals are slightly reflexed adding to the appeal. In the natural environment it grows in rocky areas, in a sunny position, however usually with some shelter from taller shrubs. Ours are grown in the ground with some shelter from the afternoon sun. We also keep some in a a container and bring them to a spot near the main garden path as they begin to flower. we think that they are well worth showing off. They are not a fragrant flower, however very pretty. Generally they are low growing, reaching only around 20 cm in height. You can grow them from seed, or from bulbs if you can find them. The name comes from the botanist and founding mender of the Linnean Society, John Sibthorp who collected plants in Turkey and Greece during the 1780s and 1790s. F. sibthorpiana ssp. enginiana, is very similar, perhaps deeper yellow flowers and more foliage. Best planted in a well drained soil in a sunny position with a little afternoon shade. It can be planted beneath tall open shrubs near the dripline. The bulbs are small however plant them at around 5 cm deep. Fritillaria sibthorpiana does require a dry summer dormancy, however summer shade is important, as is a dry summer. Our container grown plants are moved to a shaded dry position after flowering. They are also repotted and divided every 2 -3 years. These bulbs are difficult to find in Australia at present.